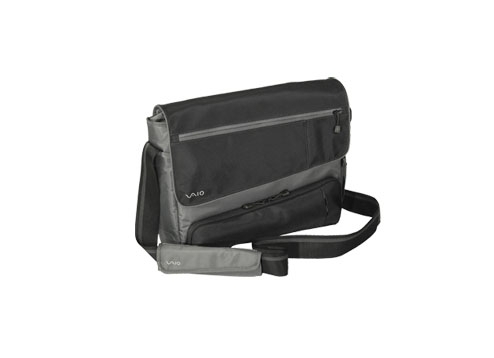 Perfect for the office or school campus, this rugged yet stylish messenger bag was designed with the mobile user in mind. 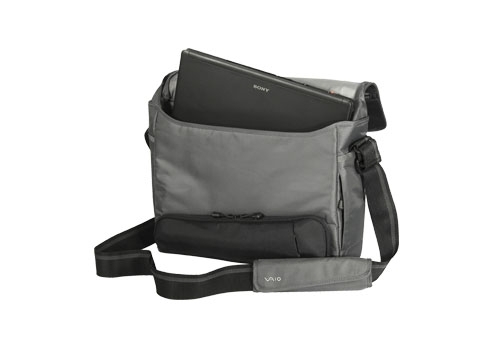 With several zippered compartments and pockets, this case has more than enough room for your VAIO® notebook, documents and accessories. The main compartment features a padded, quilt-lined notebook pouch and a VELCRO® retention strap to keep your PC in place and protected from bumps, dings and scratches while traveling. The magnetic messenger flap allows for quick, easy access to your PC and accessories. Outside the main compartment is a VELCRO® secured document pouch that offers additional space for books and notepads. A large zippered accessory pocket includes an inner mesh sleeve perfect for your AC adapter and other cables. A smaller side zippered pocket includes a keychain loop for secure stowing and easy access to your car keys. An inner accessory compartment reveals a number of perfectly placed pockets to securely organize all the extras you can't do without. The accessory compartment includes: 3 pen / pencil loops, 2 phone / MP3 player pouches, a zippered valuables pocket and an additional VELCRO® secured document pouch.